We went to Ellijay, Georgia to Colonel Poole’s BBQ. I love their Brunswick stew. 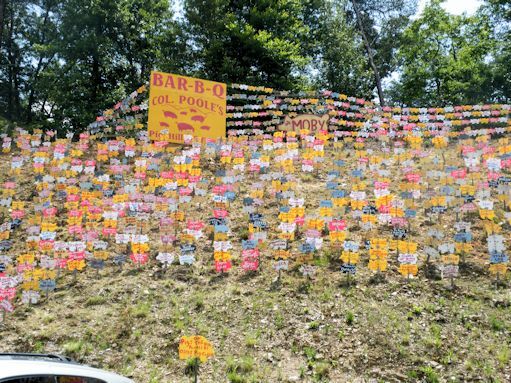 Colonel Poole’s sits at the base of a hill studded with pig cutouts with people’s names on them. You can buy a pig and it will be posted at an unspecified date in an unspecified location which keeps you coming back repeatedly to try to find your name. We have been unsuccessful finding ours. If anyone ever sees a Davis pig or an Olivia pig, let me know! I also like the pigmobile. I would love to ride in style to work in this each day. Here is a photo of my dinner. 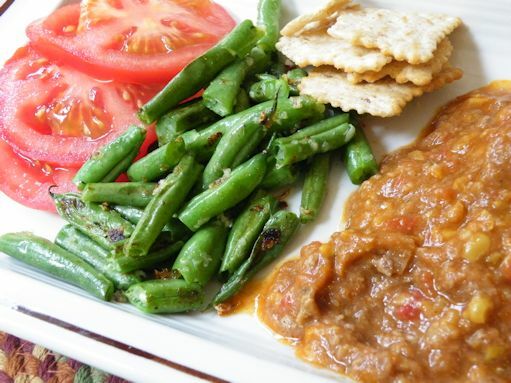 We had take-out stew and came home to pan roast green beans with garlic and onion served with wheat crackers and tomatoes. The Colonel wouldn’t give me his secret recipe for stew so you will have to settle for my not-so-secret recipe for Brunswick Stew. I know that I previously posted a recipe for this, however all my old posts are gone, so I will put it in again. From my quick research, no one really knows the origin of Brunswick stew with several parties claiming it as their own. One thing that most agree upon is that it was meat stew that simmered all day and was served to hunters in the South after they returned home from a day’s outing. Mostly, the meat was squirrel or other wild game. You are welcome to add your own tasty additions, however I will stick to chicken, beef, and pork. Cook meats and chill overnight. Chop meats and place in a large stock pot. Add remaining ingredients. Simmer 1 1/2 hours or until the hunters come home! Serves a crowd. I have never heard of that restaurant. We used to go to Ellijay when they had their apple festival in the fall. So pretty up there! 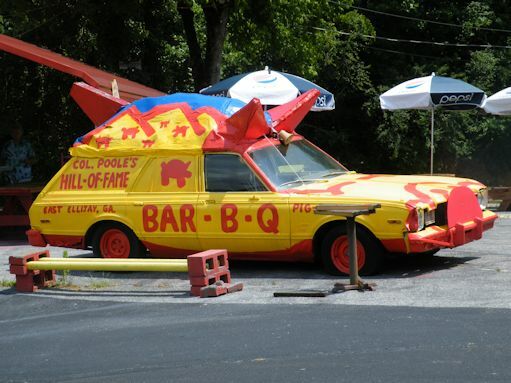 Thank you for mentioning Col Poole – I look forward to visiting this famous BBQ pit – the Morris Museum in Augusta Ga has the original painting of Col Poole’s establishment. I have a print over my fireplace. It makes me smile.